Hiring? 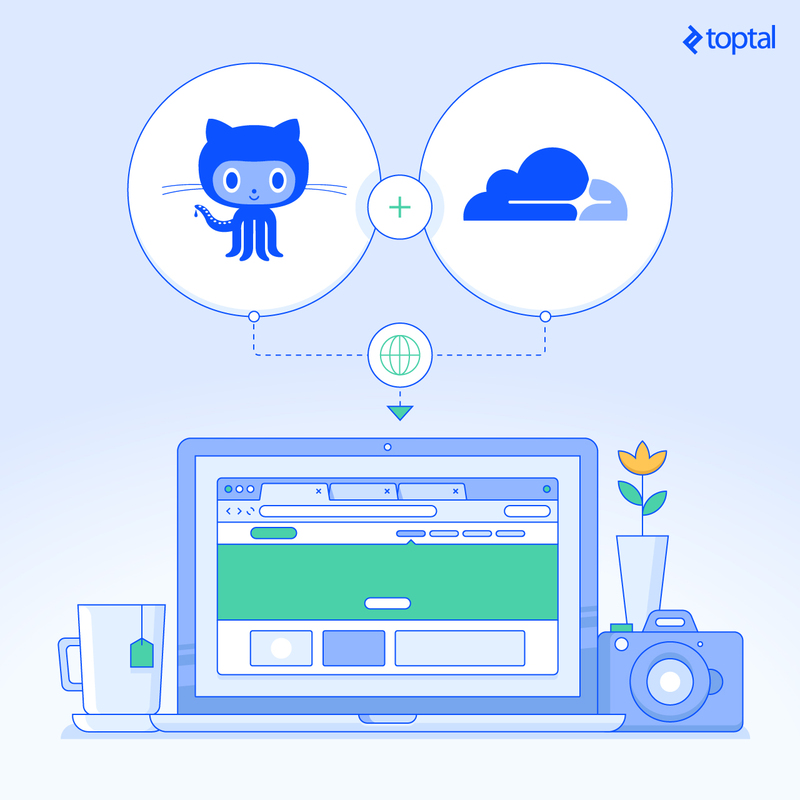 Toptal handpicks top GitHub developers to suit your needs. Static sites are wonderfully fast since there’s no server processing time involved. Also, by committing a code base of static assets in a git repository, rolling back changes simply becomes a matter of reverting to a previous commit. Backups are a git push away, and you essentially serve your entire website from the cache, meaning your server will almost never have to process a request again. Whenever I get contracted to build a website, I consider whether or not a static site is enough to meet my client’s needs, and in many cases, it is. Are you wondering what sort of use cases I have in mind? Great! Let’s discuss some situations when you may want to consider static content, and explain how this approach can save both you and your client’s time. Brochureware websites are meant to provide information about a business, and don’t change significantly throughout their life. A dynamic application is clearly overkill for such sites, and since these sites go unmaintained for years, receiving few, if any updates, they’re usually easy targets for hackers to, well, hack. 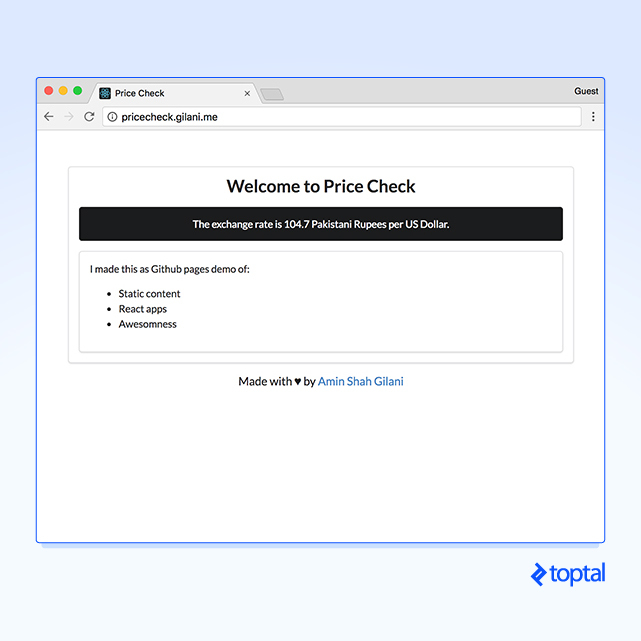 Static HTML templates are significantly cheaper than their CMS counterparts, and they are easier to tweak in the future. Developers asked to update such sites don’t require specialized knowledge about a particular CMS. As a rule, I always make static websites for brochureware sites. Bonus: Small businesses love not paying recurring monthly hosting fees. Granted, hosting is not a huge cost, but clients just don’t have to bother paying anything other than the domain, which is great. Are you showing off a wonderful, cool new app that relies on modern front-end frameworks? Your application is already mostly static. Take a few extra steps to isolate any server side logic into a separate application, and get the full benefit of having your app served entirely from Cloudflare’s cache. Your application will be available at all times. This is a tough sell. It’s hard to convince people static sites can be employed for blogs, but read me out – I haven’t gone off the deep end. Blogs are nothing more than content rendered with templates. You simply don’t need a full-blown application parsing each request and rendering a new page. A static site is perfect for this use case. Consider Jekyll. You give it Liquid templates and Markdown content, and it combines them together into a static website. No on-the-fly processing required, and your blog suddenly feels significantly faster. This workflow is especially helpful because GitHub pages support Jekyll builds. Suddenly, blog posts can be contributed with pull requests, and all your content is stored within version control. Non-developers can still contribute posts in Markdown by publishing their posts through Stackedit. In fact, I’m using Stackedit to compose this post right now! This page that you’re reading uses Disqus too. GitHub Pages is GitHub’s answer to project pages, and it allows you to serve any static website straight from your repository. 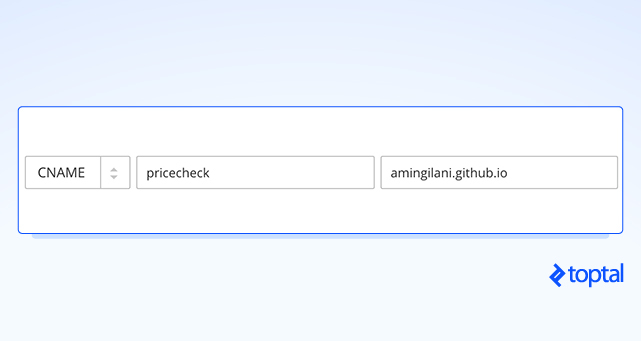 Since GitHub pages support custom domains, you can host a static website on GitHub pages free of charge, with deploys straight from Git. Enough talk, let’s see it in action! 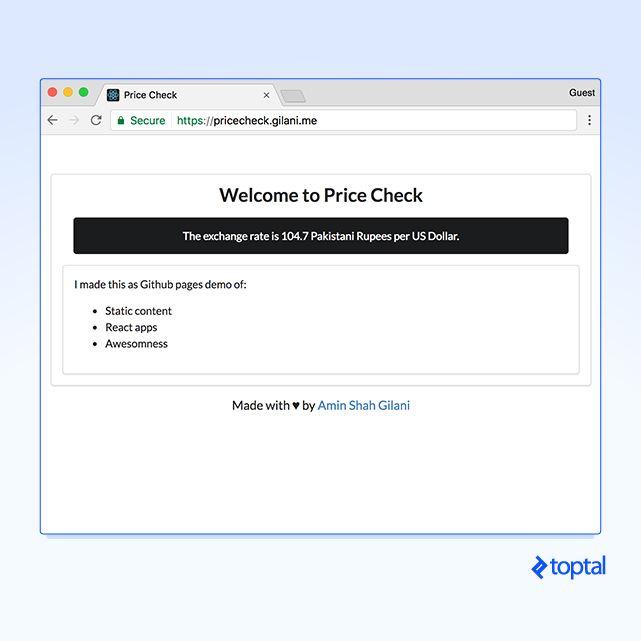 I’ve gone ahead and made a single page React app that fetches and displays the current exchange rate for the Pakistani Rupee from a public API. Let’s deploy this to GitHub Pages. First, let’s create a new GitHub repository. GitHub pages are served from a branch called gh-pages so let’s create one for my project. Writing objects: 100% (27/27), 28.67 KiB | 0 bytes/s, done. remote: Resolving deltas: 100% (3/3), done. Serving the site off GitHub is fine, but any decent website needs a custom domain name. Luckily, GitHub lets you Bring Your Own Domain to the party! First, let’s create a special CNAME file and place our domain name there. 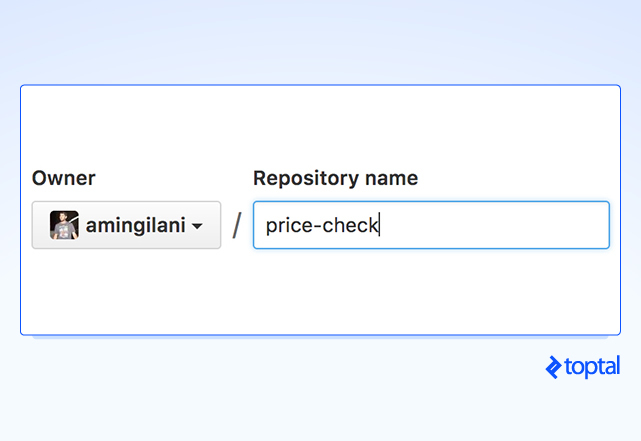 This will let GitHub know which domain name to route to the repository. Caution: Do NOT use this for an apex domain! Adding a CNAME record to the root your domain will disable your MX and TXT records. Use this only for your subdomain. Apex domains are discussed later. The default *.github.io domain is served through HTTPS. Our custom domain name is served through insecure HTTP. Do NOT use a CNAME record on your apex domain unless you want to kill your emails. Repos must be less than 1 GB in file size. Websites must be less than 1 GB in file size. Monthly Bandwidth limit is 100 GB. We’ll bypass this later on. The easiest way to get around this limitation is to use www as your subdomain, and redirect all HTTP traffic from the apex to www. In my example, I would redirect gilani.me to www.gilani.me, which points to my static site, but I don’t like doing things the easy way. If you really want to use an apex domain, check if your DNS provider lets you set ANAME records. These are (simplified) halfway between of CNAME records since they let you point to domains and A records since they don’t nullify other records on the same zone. No ANAME? The last option is to change to a DNS provider that does support this: enter Cloudflare. Cloudflare provides CNAME flattening on apex domains, which is the equivalent of an ANAME record. It’s best to make the switch right now since we’ll be covering Cloudflare in the next section. 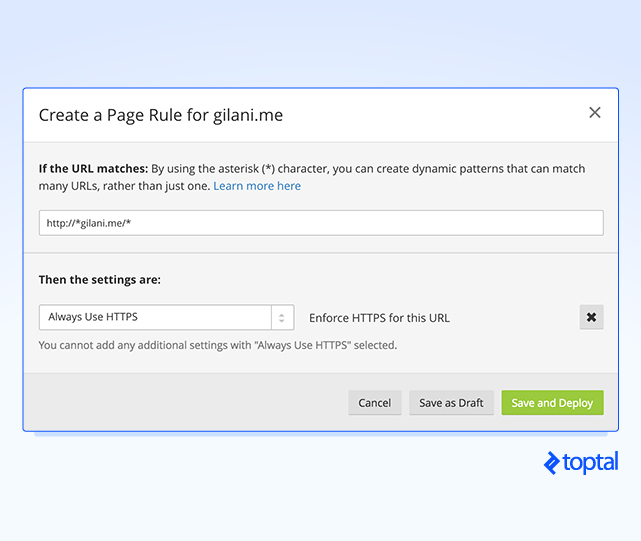 TLDR: Switch to Cloudflare’s free DNS and set a CNAME on your apex domain. They do something special with their CNAME that makes it work. Welcome to the post-Snowden era. All our worst fears of government-sanctioned snooping and hacking have been confirmed, and the world is scrambling to secure data in transit and at rest. As a modern web admin, you’re expected to provide at least SSL on your website, with no mixed content. It’s come to the point where Google Chrome marks plain HTTPS websites as insecure and Google Search is beginning to favor HTTPS websites more favorably in their rankings. We’ll discuss even more strategies for making your front-end secure later, but for now, we’ll only cover SSL. 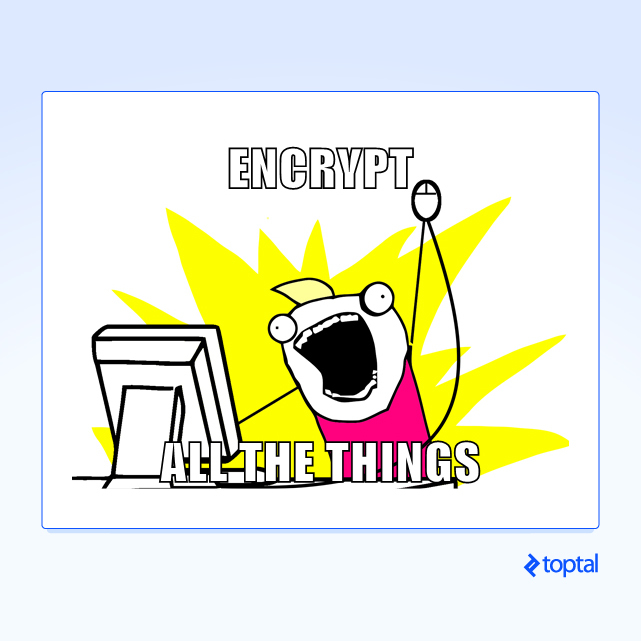 Fortunately, we now have Let’s Encrypt. It’s a non-profit and entirely automated Certificate Authority (CA) that lets you programmatically issue short-term 90-day SSL certificates for any domains you control. It’s a breeze to use; it’s open source; and the project is backed by a plethora of companies, including Mozilla and the Electronic Frontier Foundation. Cloudflare is a DNS, CDN, and DDoS protection service. It caches your website, and serves it to users from servers geographically close by, making your website faster. It has the added benefit of keeping you under GitHub’s 100GB bandwidth limit because even if your website becomes insanely popular, most requests will hit the cache, and never reach the server. On top of this, Cloudflare offers a service called Universal SSL where they issue you a free SSL certificate from their CA partners, so you get HTTPS for free… forever. I know what you’re thinking: Gilani, you just told me how awesome Let’s Encrypt is. Why are you talking about Cloudflare? Well, it all comes down to simplicity. As a mental exercise, imagine setting up multiple Nginx cache and reverse proxies around the world, giving them all valid SSL certificates and serving users web pages from their closest locations. This results in your website being served via SSL even if the origin server doesn’t have an SSL certificate, although Cloudflare gives you special self-signed certificates that you can put on your origin server to secure the connection up to Cloudflare’s servers. This is what Cloudflare gives you with a free plan, and you don’t even have to renew your certificate every 90 days. As a freelancer, I get clients who want a site up and running for their business as fast as possible. They don’t understand or care about security concerns, plaguing the modern web, or encryption during transit. Some clients struggle to understand the idea of domain names, and find it annoying when they have to pay a $15 annual fee “just to keep my website running”. So try explaining to them why they have to pay for a cluster of reverse proxies protecting their website that runs on free hosting itself. Force “Automatic HTTPS Rewrite” to kill mixed content warnings. At this point, our website will work over both HTTP and HTTPS. Let’s force HTTPS for everything on our domain. All done. Our website should always load over HTTPS with a green “Secure” rating in Chrome. There are a few things I didn’t discuss above, and I’d like to take a moment to clarify a few points. X-Frame-Options: disables your website from being loading in an iframe. And you’re right. GitHub pages and even Cloudflare do not allow you to customize your HTTP headers. However, you can set a CSP using the HTML meta tag. However, at the moment, there is no practical way to set the X-Frame-Options header on GitHub pages, meaning an attacker can load your webpage into a specially crafted iframe and pull off an XSS attack. If you’re dedicated, though, you can workaround this issue by asking users to confirm their password or 2FA token upon every sensitive action, or by passing a CSRF token upon every authenticated request. A major concern to some is that by using the free public repositories at GitHub, your website and source code is available to anyone that wants to fork or download it. So I think the concern here is misplaced. Static content isn’t source code in the sense that it isn’t compiled or processed as a script before being served to the user. Your user will get the exact same static copy of the website if they were to run a web crawler pointed at your website. While hosting the code in a GitHub repository certainly makes it easier to download a copy of your website, it doesn’t expose anything that wasn’t already public. The ideas presented in this article are not limited to free web hosting of small applications. Making a new exciting web based game?! Check out GameSparks, and you are good to go. Using Github Pages as a "standard" hosting service, that is expected to handle high bandwidth websites, is discouraged and should not be done. Adding Cloudflare CDN on top of GitHub Pages makes this solution work. Cloudflare is much more than a free SSL service. It's a company with a global CDN that protects your website from surges and keeps the load on GitHub pages minimized. In this article, I made it appear as though I manually published my React app to gh-pages. I did no such thing. I worked on master and when it came time to deploy, I ran npm run deploy which kicked off a build script and pushed the build to gh-pages. Please see the master branch of my repository to see how it works. This app is live at pricecheck.gilani.me and should be available indefinitely. Amin is a developer and entrepreneur who writes clean, test-driven code in Ruby and ES6 wrapped in perfectly-crafted containers for DevOps. As a freelancer and two-time co-founder, he's launched products making $10k+ in revenue, successfully raised funding in Silicon Valley for his Pakistan-based startup, and won two hackathons—from among 300+ global entries. In his spare time, he authors technical content and contributes to open-source. https://uploads.disquscdn.com/images/774049553f09025241728f0a4f50e6ab01a95102f914b092af0bfc50910973de.jpg I pulled the shell off of my snail to make him faster Turned out it had the opposite effect, now he's a little sluggish. It doesn't. Which part of the terms specifically concerns you? Edit: I should elaborate. Don't host client sites on your own personal account. Create an organization for them and add it there, because you're allowed "to host your organization pages". As long as the client knows what's going on, you're not violating any of Github's terms. The Github pages are for the projects you are hosting on the github not for the website hosting. That's cool, great article. For static content I use plain EJS/lodash templates together with Webpack (check htmlWebpackPlugin). With Webpack in place, it's easy to setup both SPA and static content in the same code base. IMO Firebase is also good for hosting, speedy HTTP/2, you get SSL out of the box too. The author hosted the page sources as a project in Github, so Github Pages as the website hosting is legitimate use. Sadly, the only downside to this, is that disqus is now pushing ads (and idiot stupid non-personalizable ads) onto sites without anyone's consent. They claim small non-commercial sites will escape it, but time to start looking for a different commenting solution. Great and insightful. Love it. Can explain more how to switch to routing all of your traffic through Cloudflare? Do I need to pay for the service? You'll have to sign up for Cloudflare and follow the instructions above. And no, it's free. Problem is: what, if they need a basic non-static feature? Thanks a lot Amin. Its really very informative.